Are you looking for ways to preserve your e-mail correspondence, photos, and other digital memories? Come hear Dr. Donald T. Hawkins, author of a recently published book, "Personal Archiving: Preserving Our Digital Heritage" (Information Today, 2013). He will discuss the growing importance and awareness of personal digital information, how to preserve it, the legal issues, archiving your e-mails, and commercial services. Following his presentation, he will be available for book sales and to demonstrate the digitization of photos. Sponsored by Cherry Hill Historical Commission. For more information: 856-488-7886 or CHHC@CHTownship.com. Tonight! 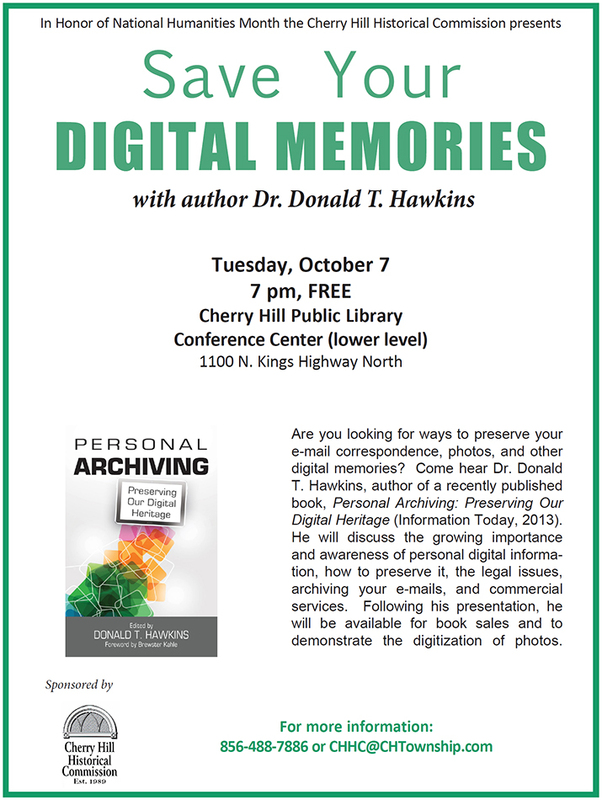 "Save Your Digital Memories" with author Dr. Donald T. Hawkins at the Cherry Hill Library at 7 p.m., FREE.